Materials science as a discipline is less than sixty years old, but has quickly become a dynamic field at the cutting edge of research. MRS-Cambridge Materials Fundamentals will provide a forum for high-quality textbooks targeted at advanced undergraduate and graduate materials science students, as well as researchers from other disciplines requiring an understanding of the core principles of materials science. 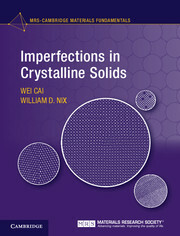 Books in this series will take a rigorous and pedagogical approach to the fundamentals of materials science, including thermodynamics, kinetics, structure, defects, and material properties and characterization.